After finishing as the top rookie in the Indianapolis 500 last month, we caught up with Dale Coyne Racing's Ed Jones for a chat about all things IndyCar. 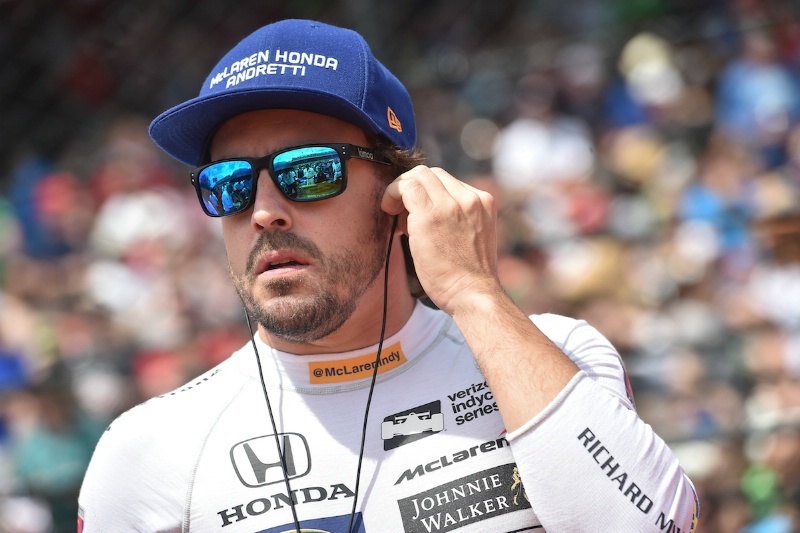 While the spotlight may have largely fallen on Fernando Alonso when it came to rookies in the Indianapolis 500 last month, there was another driver who actually left the Brickyard as the highest-finishing debutant. Ed Jones has been enjoying a quietly impressive debut season with Dale Coyne Racing in IndyCar, having stepped up from Indy Lights at the end of last year, and was able to finish third in the '500 at his very first attempt. We caught up with Jones following his Indy 500 charge to talk about his season so far, his rise through the ranks, and whether there were any hard feelings about his loss to Alonso for the Rookie of the Year award. You're coming out of a really busy period and particularly the month of May, which finished with a third place finish in the Indianapolis 500. How would you sum up your month? Yeah it was obviously very long! I've never done so much driving is such a short period of time. After the grand prix which was the second weekend of May, that was on the Saturday, then Monday we started driving on the oval, and we drove pretty much for seven days straight. I had never done something like that in racing before, so it was pretty intense and a lot of hard work. You were learning a lot every time you went out, but it obviously got very tiring mentally and it's about being able to pace yourself in the right way to handle that because there was so much to take in. But from the get go we were pretty strong. The setup we had on the car was pretty good and we were able to develop that a bit. It was good that we had a fast car in both qualifying trim and race trim, which obviously is really important. Did you feel it was a confidence that built through the month and grew as you went along? It was your first time driving an IndyCar on the IMS oval. Yeah it was my first time driving an IndyCar on the speedway on that Monday, when I did the rookie orientation. Everything was new, and it just felt comfortable straight away, which is obviously really important in allowing me to attack and push on. Going through you qualifying, you just missed out on a place in the Fast Nine and the shootout for pole. Was that quite disappointing your end? Yeah, it was pretty frustrating. We were running in the Fast Nine up until the second last guy. I was one of the very early cars to go out, and the way it worked, the track had been rained out, so we were delayed by like five hours or something. And so it was quite a disadvantage going out early. We kind of expected that we were going to drop down because of that. So it's frustrating, but at the same time it's promising that we were so strong in that sense. We were able to go out early and still be really competitive. In the race itself, you were there or thereabouts pretty much throughout and then it got towards the closing stages and you were in that top five. Was there a period where you thought: 'Hey, I could maybe win this thing'? Yeah the race as well - I've done long races in the past, but that just took it to a new level. There were so many ups and downs. We were running pretty strong, just saving fuel, running smart in the top 10 for the first half. Then when Dixon had his crash we hit some debris, which damaged the rear wing and meant we had to completely replace that, and that sent me back to last. After that, usually in races when that happens, you're kind of finished for the day, but we kept working through and we kept making progress. A few things fell our way, and the last 20 or 30 laps we were right up there. I realised we had a really good shot at winning the race. It was just about attacking as much as we could. Unfortunately I actually had some damage on my front wing, on the nosecone, which created a lot of drag and made it very difficult for me to pass. I was lacking a lot of speed in that last 20 laps, which looking back is so annoying, because I think without that we had a really good shot at winning the race. So yeah, it was good to battle for it on my first go. You never expect that going into your first '500. The other thing was I just learned so much throughout the race. Although we had done a lot of testing, you're still never completely prepared for it, and so I got so much more comfortable from the beginning to the end, just adjusting the tools you have in the car with the roll bars, the weight jacker, and things like that. It was such a long race, so many ups and downs, but so much learnt that I was able to apply at the end and it gave us a great result. Do you think P3 is more than you could realistically have imagined doing in your first attempt at the Indy 500? It's hard to say. We knew had a good car and we were so competitive the whole time, we knew that if things fell our way we would have a shot at winning it. There are so many factors in the '500. You always hope you can do that, but again, it's hard to know what to expect. We knew we had a chance, but for it turn out that way was maybe a little unexpected but at the same time, I was confident. Yeah, exactly. Obviously the crash had a big impact on the whole team. Firstly it was pretty stressful, with such a big crash, hoping Seb was OK. Fortunately he is and he will make a full recovery. And then secondly it meant a huge amount of work for the whole team to rebuild another car. So it's great to give something back to them for all the hard work that they were doing. That's race. There are so many ups and downs. It's fortunate that we were able to pull through that. I think there's some momentum moving on. One of the big talking points after the race was you missing out the Rookie of the Year award, as voted for by the media. There was quite an outcry on Twitter about it. Were there any hard feelings from your end about that decision? Obviously at the time when I found out, I was pretty frustrated. But at the end of the day, I don't really have to say anything about that. As you said, I think everyone else on Twitter showed what they thought. We were fighting for the overall win of the race. As great as Rookie of the Year would have been, I was up there fighting for the win. Going into that '500, I think Rookie of the Year was decided before anyone turned a wheel on track. It's annoying, but at the end of the day, the fact that I was fighting for the win is more important to me. I think there was a sense at points in terms of media coverage and the hype building around the 500 that you had Alonso and 'the other 32', which was a bit of a shame at points. Did having that spotlight on him ease a bit of pressure on you in the race? I didn't really think about that. Obviously it was great to have him there, great for the event, great for the sport. But we were doing our own job and doing really well. We had the second-fastest time of the whole month, the second-fastest speed of any time in the whole month. We were ahead of him in the race before he blew up. We were strong the whole month. That's what we were focusing on. Like I said, it was good to have him there, but we didn't treat him any differently on-track. You mentioned that is was a good boost for the series. Do you think it also helps in terms of your own personal awareness and profile as a racing driver? We saw a 900 per cent increase in UK viewers. If they tune in and see a British-linked racer, do you think that's a good thing for you? Yeah definitely. It got a lot of attention. And I think people are starting to realise how strong IndyCar is. It's one of, if not the most competitive series in the sense that a lot of people can win the races. The teams are so close, the margins are so much smaller. It's not like Formula 1 where you know who's going to win before the race starts usually. It's great and hopefully more people are going to start coming over because I think the racing package itself is amazing. For the drivers it's one of the most enjoyable series because you're always wheel-to-wheel with the other drivers and have a good race. For maybe some of our UK readers who aren't familiar with your background: you did you karting in the UAE before making your way up the European ladder and then moving over to the US. What was behind that decision to make the move over and join the US ladder? We were doing pretty well. I won the Formula 3 Open championship in 2013, and then we were having a good year in FIA F3 after three rounds, and I broke my back and so I missed most of the rest of the season. I came back at the end but I wasn't fully fit. I was still struggling a lot with an injury. I felt like in Europe that obviously there is politics in all racing, but I felt like it was even more stretched out even in the junior series, and it was kind of persuaded who they wanted to move forward before just the driving itself. We looked at America and we saw the support of young drivers doing well with the Mazda Road To Indy (MRTI) where if you win the series, they support you to move up to the next one. There's nothing like that in Europe at the moment I don't think. It was a clear, clear path for me. If I did well in Indy Lights, I'd be able to move up to IndyCar. That's fortunately how it turned out. At the same time when we were thinking about that, Carlin had the same idea. It was just by coincidence that we both wanted to move over at the same time and it just made that whole transition so much easier. I was going to come onto the role of Carlin and MRTI in terms of boosting your career. Carlin is such an established junior team and for them to move over was significant. Would you say those have been the two big driving forces behind getting you into IndyCar? Yeah for sure. Before, apart from Carlin, we didn't know any of the American teams. We didn't know anyone in America. So it was kind of like we had the ideas going there, but we didn't know how to go about it or anyone to do with it. Carlin going over just made the whole process possible in a way. It was a change itself, going to America. I'd never been to America to race there really. That transition itself, it was nice to have some familiarity with the team and people I worked with previously. I think without Carlin going there, I'm not sure 100 per cent that I would have come over here. But for my career it was the best decision, because where we are now... you know I look at a lot of the other drivers and when I was racing, some guys were really strong, but in Europe, the way it is now, for Formula 1 unless you have, you know what I mean, the huge amount of funding, it's not really possible to get there. Whereas over here, they really reward you doing well and there's a really good support system with the MRTI. In terms of looking back at the decisions I've made, I think it's the best one so far. Do you think there is a better junior scheme out there than MRTI? Not that I know of. Obviously when World Series was still with Renault, they did the scholarship, but again then it stopped. Whereas in the MRTI, it's all the way from USF2000 which is say a Formula Renault equivalent. If you win that, you go up to Pro Mazda, which is like their Formula 3, then Indy Lights, which is there Formula 2, and then to IndyCar. The thing I really like about it and why I think it's really great for young drivers, there's just that one path. You know exactly what you have to do to move up, whereas in Europe at the moment, it's great to have so many competitive series, but there are almost too many of those series. It's difficult to decide sometimes what to do, which makes it harder. How did the deal with Dale Coyne Racing come about? Winning Indy Lights guaranteed you a place in the Indy 500 and two other IndyCar starts, but you managed to secure a full-season package. Dale came to my last Indy Lights race and he came and spoke to us at a few races before that. Straight after that, I went to the IndyCar final race at Sonoma, and we started talking there. Things moved really quickly. We both knew what we wanted to do. Dale had already secured Sebastien Bourdais for the first seat, and it was the perfect scenario to have a rookie in there as well. Just the whole situation with the team and another driver, it was a perfect package for me. Looking back on your rookie season so far, the second race in Detroit was a bit of a tough one, but otherwise how would you look back on how you've done so far this season? Yeah it's been really positive. It was really helpful having Seb there, he's got a lot of experience at a lot of the tracks. We had a lot of top 10s. Detroit was probably the first race weekend where I felt like a rookie. It was a new track for me, I'd never been there before, so that was tough. But after race one at Detroit, we were running seventh in the points. It just shows how well it's gone. I was confident I would do well, but I'm surprised how smoothly the whole transition went, and a lot of that is down to the work that the Dale Coyne team has put in and the team around me with the engineers to help me get through that. Now with Sebastien out for pretty much the remainder of the season, do you feel more responsibility to step up and lead the team? Yes, of course. It's a big loss for the team and on the selfish side as well, it makes things a lot tougher for the rest of my rookie season. I'm confident. We work well together. I reckon we can produce more strong results. What kind of goals do you have for the rest of the season? A podium has been ticked off now so is a win the next thing you're chasing? I'd like to get another podium and a win would be the ultimate, but I think we want to try and get more consistent in the top five. When we've been running strong, we've been able to be in the top 10 quite a lot. I think over half my results are in the top 10. So let's try and push a bit more forward and make it more consistent. If we can start being more consistent in the top 10, top five, we can then start aiming for a win. After doing so well on a superspeedway like Indianapolis, to now to Texas which is a similar circuit, do you feel more confident going into this race? I've never actually been to Texas so again it's a new track for me. There's not much practice time, so it's going to be tough. As you said, we had a strong package at Indy, so hopefully that translates. It's one of those tracks where watching the racing in the past, it's really hectic and crazy out there. We've got to adjust into that. We know we'll be competitive and working hard to produce another great result. I guess it will also be nice to get a break after Texas. You've had five or six weeks of constant racing and prep, now you're going to get a couple of weeks before Road America. Yeah, I'm actually really looking forward to that. I've never had in all the racing I've done, it's never been this hectic before. This is the first time I've been home in like six weeks. In the past two or three months, I've only been home for five days. It's been so busy. It'll be really nice to have a rest and recover and get back at it at Road America after Texas.